Image taken in Haunted Canyon, Pinal County, Arizona. October, 2006. 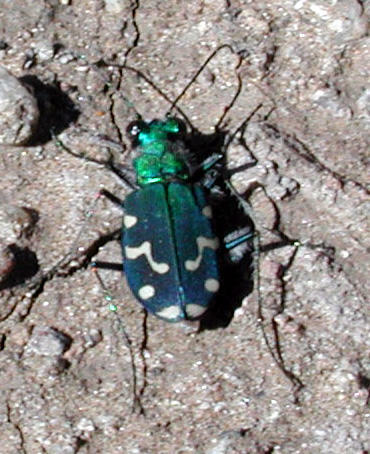 Tiger beetles are among the supreme predators of the insect world. They are agile and beautiful insects equipped with ultra-sharp mandibles and ultra-acute eyes. Their long legs and fleet wings allow them to quickly approach and capture potential prey while avoiding predation themselves by larger, vertebrate predators. The best place to find them in the Sonoran Desert is along damp stream beds in riparian habitats. The preferred habitat must be relatively free of trampling feet and crushing tires because their larval forms are to be found nearby within the sandy substrate. These larvae are formidable predators in their own right - they hunt from vertical tunnels in the moist sand extending out with lightning speed to capture crawling insects that venture within range. Otherwise they remain in the tunnels until maturity avoiding desiccation and predation.